Big News for Tripawds Bloggers! Basic Tripawds Blogs will always be free. Jerry wouldn’t have it any other way. In order to do this, however, we have updated our Supporter framework to offer three levels of support with even more enhanced features to those who wish to help keep this community online with an ongoing PayPal subscription. Please review the updated Tripawds Supporter account feature comparison for complete details or consider upgrading your blog now. We are offering a discount to the first five lucky Tripawds Bloggers who upgrade their account! Use coupon code TRISUPP25OFF to receive 25% off your first payment of any Tripawds Supporter level! This coupon code can only be used five times so upgrade your blog now and save! If you have not yet upgraded your blog, you may notice some new content being inserted into your posts and pages. (See links at the top and bottom of this post.) Consider upgrading your blog to immediately remove these ads and Support links. Supporters can remove ads from other favorite Tripawds blogs from their Dashboard -> Supporter Status -> Disable Ads. There are now three Supporter levels to choose from for showing your appreciation of this community and enabling enhanced features on your blog. Certain plugins are now only available for Supporter II blogs. If you are a current Supporter, do not deactivate these plugins or you may need to upgrade to get them back. Premium Themes are now only activated for Supporter III blogs. If you had previously activated a premium theme, do not change it or you will need to upgrade to switch back. If you are a subscriber and had the Supporter Badge displaying in your blog, you will need to replace it with your current level badge by dragging the Supporter Widget back to your sidebar from the Appearance -> Widgets tab in your dashboard. You can upgrade, modify or view the current status of your Tripawds subscription anytime from the Supporter tab in your dashboard. Most importantly, Tripawds Supporters gain the satisfaction of knowing that they help us maintain the largest online community for three legged dogs and their people. Below is a comparison of all account features. Please visit the Supporter Upgrade page and select your site to see additional monthly or quarterly payment options and pricing. The Tripawds Supporter framework is powered by the simple to use yet massively configurable Pro Sites plugin from WPMU Dev. After network-activating this multisite plugin, we were able to easily create the Supporter options and associated account features above by enabling different modules and assigning certain plugins and themes to each Pro Site level. Prohibit or limit publishing of posts and/or pages for selected Pro Site levels. Provide “unfiltered_html” permission to specific user types for selected levels. Restrict XML-RPC and Atom Publishing to selected Pro Sites. Only allow blog access for paid sites. Limit BuddyPress group creation and messaging to users of a Pro Site. Pro Sites includes far too many features for me to list here. The multiple Supporter levels, ease of use, coupon codes and robust statistics were reason enough for us to upgrade. Check out the Pro Sites plugin in action to see how you might use it for your multisite network! Posted on February 18, 2012 February 19, 2012 Author adminCategories AnnouncementsTags blogs, plugins, Pro-Sites, supporters, wordpress multisite, wpmu dev premium2 Comments on Big News for Tripawds Bloggers! We considered posting this in the Tripawds Downloads blog, but it has much more to do with blogs than it is about three legged dogs. While we provide Tripawds bloggers with helpful WordPress tutorial videos, and do our best to answer any technical questions about blogging in the Tech Support forum, we want to provide more information for those who want it. That’s why we’re making this comprehensive guide detailing How To Publish a WordPress Blog available as a free PDF download. This comprehensive WordPress How To Guide covers everything you need to know about writing posts and pages, customizing your blog layout, moderating comments and much, much more. And did we mention it is absolutely free? 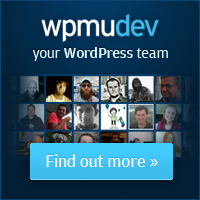 This is just another value added service we are able to offer thanks to our WPMU Dev Membership. Let’s talk about widgets. 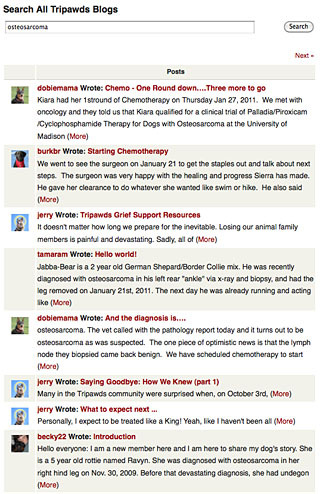 Specifically, the 2010 Tripawds Campaign widget popping up all over the Tripawds community recently. We are always happy to see new members join and create their own Tripawds Blog. But we are always surprised to see some of those same new blogs still have their default sidebars months later. We recommend all new bloggers view their blog and follow the helpful links provided in the default sidebars for doing things like changing the custom header, uploading user and blog avatars, and yes… updating the sidebars and widgets! 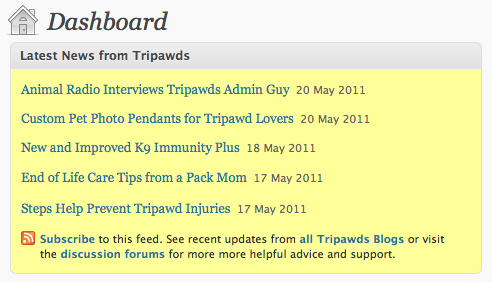 All blog themes available to Tripawds Bloggers include at least one sidebar. 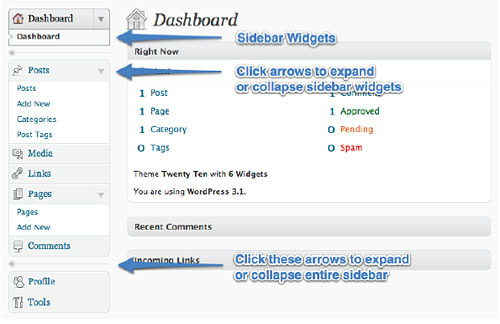 Widgets are sections that can be added to these sidebars from the Appearance menu of your blog dashboard. Standard widgets include a calendar for archived posts; lists for post categories, blog pages, or favorite links (your blogroll); recent posts and comments; meta information; or any arbitrary text. Simply drag the widget you want to the preferred location in your desired sidebar, and “drop” it. Configure any available settings, click save and visit your blog to see the changes. The text widget is the one we’ll be using in our example here. Follow the instructions below to help show your support for the 2010 Tripawds Community Campaign by adding the ChipIn widget to your sidebar. Copy the ChipIn embed code by clicking the “copy” link in the widget above. Visit your blog Dashboard -> Appearance -> Widgets tab. Expand the sidebar where you want to add the widget (If it is not already visible). Release the widget and an expanded field will appear. Paste the entire ChipIn code you copied into the content area of the new widget. Click Save, and view your blog to see the changes. You should notice the new sidebar widget in your blog, just like in the right sidebar of this blog. (NOTE: If widget is missing here, the campaign must be over!) Don’t forget to remove the widget when we reach our campaign goal so we can stop begging for help. Thank you for yor continued support. Any questions? Ask with a comment below or in the Tripawds Tech Support forum so we can share the answer with the community. If you’re wondering what the heck ChpIn is, click the “about” link in the widget or check out the Tripawds ChipIn Page for complete details.